"While this decision was a difficult one, we continue to have a great deal of love and respect for one another"
In this file photo, John Cena and Nikki Bella attend an event at Radio City Music Hall on May 15, 2017, in New York City. The couple announced their splitting up after six years together. After six years together and an engagement, John Cena and Nikki Bella have announced they are parting ways. The two have been together since 2012 and documented the trials and tribulations of their relationship on E! 's "Total Divas." 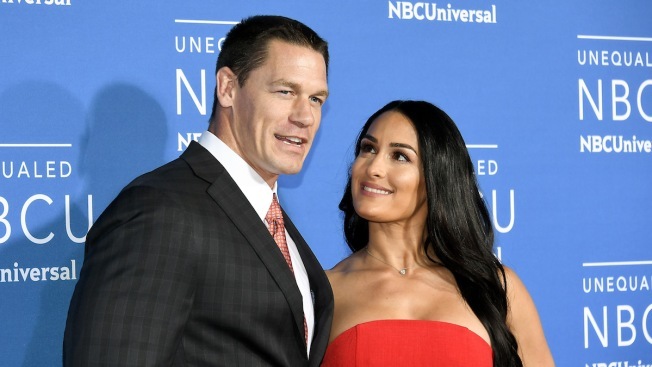 A rep for the couple confirmed the news, "After much contemplation and six years of being together Nikki Bella and John Cena announced today their decision to separate as a couple." The couple released a joint statement to E! News, "While this decision was a difficult one, we continue to have a great deal of love and respect for one another. We ask that you respect our privacy during this time in our lives. " In January, the WWE stars celebrated their impending nuptials with an engagement party, which was nine months after the star popped the question. Cena famously proposed to Bella in the middle of the ring at WrestleMania 33 in April 2017. "Such a wonderful, meaningful, emotional day yesterday with the woman of my dreams and both of our families," Cena tweeted the day after their engagement party. "I love you Nicole, you've made me realize the importance of togetherness." Bella replied at the time, "Aww my Love... It was so magical. Love you too John. " In January, John told E! News that the wedding planning was about to "amp up." The 40-year-old said, "It's kind of a special time where there is a little bit of lull and I'm really looking forward to spending some time with Nicole and work on that. Hopefully, in the next few weeks the wedding planning is really going to amp up!" Nikki also told E! News that the date of the wedding had been moved up. This story was first reported by Us Weekly.